The more I visit Yabby Lake with my valued customers, the more impressed I become. The cellar door is nestled unobtrusively among native vegetation, with the now maturing local gum trees offering dappled shade as you amble down to the cellar door and restaurant. For the remarkably high quality of the award winning wines – there is nothing ostentatious here. 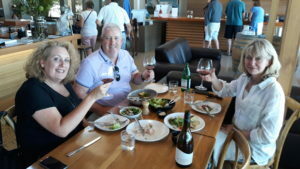 All the team members at the cellar door and restaurant seem to have be well chosen and well trained to be welcoming, friendly, and professional. A casual lunch at Yabby Lake. High quality food, wine, people and glasses. What’s not to like? Much like the delicately handled grape juice in the winery, I have realized that everything flows naturally here. From the warm greeting at the cellar door, to the informal style of the restaurant, you feel welcome. There are leather couches and seats where you can sit comfortably with a glass of wine and chat. The ambiance even lends itself to quiet reading. Hopefully you are flicking through one of the many food and wine magazines or books provided – with a glass of something fabulous in hand. Hopefully you are not checking your emails on a smart phone? The restaurant extends seamlessly outside, and I observed groups of friends and families relaxing on the lawn, taking in the stunning views, on picnic rugs and huge cushions – obviously supplied by Yabby Lake. There is an an array of art installation that form a sculpture park, and children feel welcome and are engaged, exploring the installations. My customers were most happy with the shared platters they enjoyed for lunch. The other important thing to mention, of course, is that Yabby Lake produce some of the most highly awarded and well regarded wines in Australia. The word ‘passionate ‘ has become somewhat cliche these days – so you will understand what I mean when I write that Tom Carson, as Group Winemaker, puts his heart & soul into producing beautiful, elegant and site specific wines. He is of course supported by a great team of like minded, talented people, flowing from the winery, the cellar door and restaurant. Tom, ex Yering Station in the Yarra Valley, is considered to have one of the best palates in the country, and has been a great driver in producing and promoting cool climate wines that are elegant, often lower in alcohol and specific to the Mornington Peninsula region and vineyards. Most importantly – the wines are food friendly. Tom is a highly respected wine judge at many of the major wine shows in Australia. He has also been influential in highlighting the charms of Victorian wines at the prestigious Royal Melbourne Wine Show. The impressive range of wines on offer at the restaurant and cellar door span several tiers. The Red Claw range offer solid, value packed wines displaying regional character. The Yabby Lake ‘Single Vineyard’ range ratchet thing up a notch or two, displaying premium quality Chardonnay, Pinot Noir, & a small amount of Pinot Gris. These wines reflect a modern style and mindset. All about purity of fruit, gently framed by high quality French oak. Importantly, the oak never dominates the delicate flavours. It is fascinating to taste wines that are expressive of a single vineyard, especially when they are this good. Medium bodied and supple, it is a delight to savour a glass at the restaurant in their large format glassware, offering up maximum aromatics and drinking pleasure. No wonder the 2014 Yabby Lake Single Vineyard Pinot Noir was the first Pinot Noir to win the prestigious Jimmy Watson Trophy at the Melbourne Wine Show! It come as no surprise that in the current edition of the James Halliday Wine Companion – 2019, the following points were awarded. 2017 Single Vineyard Mornington Peninsula Pinot Noir – 96 points. 2017 Single Vineyard Mornington Peninsula Chardonnay – 95 points. 2017 Single Vineyard Mornington Peninsula Pinot Gris – 95 points. For fans of Syrah, (cool climate Shiraz), the Single Vineyard range offer a 2017 Syrah, awarded 95 points by Campbell Mattinson. For some reason, one that I shall not argue with, this wine is priced at a low $36. Inspired by the delicately perfumed Syrah of the Northern Rhone, this medium bodied beauty is supple and long on the finish. The Single Vineyard Pinot Gris sells for about $33 per bottle,while the Chardonnay is priced around $45. You can expect to part with about $60 for a bottle of the Pinot Noir. As if this delightful range is not enough. Wait, there is more! rientation and soil profile of a small parcel of land within the vineyard. These wines are also very expressive of the vagaries of the vintage. All of this information is lovingly nurtured and harvested – and offered to us in a never to be repeated vintage wine. Of course the quality of these wines did not escape the great palates or the 2019 Wine Companion either. The 2017 – Single Block ‘Block 6’ Mornington Peninsula Chardonnay was awarded a rare 98 points. The 2017 Single Block Pinot Noir was awarded 97 points. Both of these small production wines are priced at around $95. Yabby Lake are also the proud makers of a strapping, full bodied Heathcote Estate Shiraz. The fruit is grown in Heathcote, and when perfectly ripe, is picked and transported to the Yabby Lake Winery. This is often carried out at night,to keep the Shiraz grapes nice and cool before their fermentation. The Heathcote Estate Shiraz 2016 is an impressive counterpoint to the Yabby Lake S.V Syrah. Grown on the hallowed, ancient Cambrian soils of Heathcote, it displays regional blueberry notes, the taste is full and satisfying. Matured in French oak, there are enough ripe, grippy tannins to keep the ‘Big Red’ lovers enthralled for quite some time.It sells for around $45.